St. Paul’s Community Cemetery is an important part of our heritage. It is a part of the history of the life of our church, its members and some of the earliest settlers of Lanark County. St. Paul’s Community Cemetery is an important part of our heritage. It is a part of the history of the life of St. Paul’s, its members and some of the earliest settlers of Lanark County. Originally, St. Paul’s cemetery was located on the church grounds between the church and the river. When it was decided to build the rectory in 1878, a new home for the cemetery had to be found. 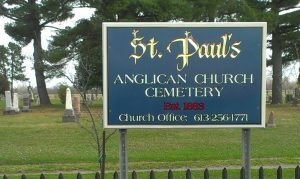 The land for the current cemetery was deeded to the Rector and Wardens of St. Paul’s Church, Almonte in 1883 by James Rosamond, to be held in trust as a burial ground for the congregation and any person owning or purchasing plots in the Cemetery. James Rosamond is buried here, along with many members of the Rosamond family. The early years of the cemetery are poorly recorded but the earliest burial may have been about 1866. A number of headstones were placed against the western fence several years ago that do not mark gravesites. It is believed they were moved from St. Paul’s churchyard sometime in the 1880s. A small marker was dedicated ‘in remembrance of our Comrades who are buried in St. Paul’s Cemetery’ in 1981 by the Royal Canadian Legion. One of these comrades is Arthur Holland who ‘died of wounds in the Battle of Vimy Ridge, April 11, 1917, age 23 years’. The largest monument in the center of the cemetery is a memorial to Dr. William Mostyn, a beloved family doctor of Almonte who drowned on a rescue mission in the frigid waters of the Mississippi in early hours of March 28, 1881. Dr. Mostyn is buried in Cataraqui Cemetery in Kingston. In 2015 our Cemetery acquired two solid granite columbaria, allowing us to continue to meet the interment needs of our community. These two curved units have been placed in the centre of the Cemetery overlooking a Scattering Garden. 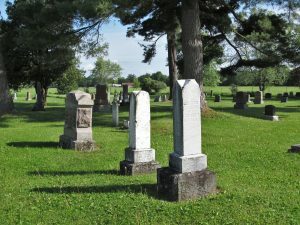 St. Paul’s Community Cemetery is operated on a non-profit basis with most of the upkeep and maintenance being performed by a team of dedicated volunteers. Although the Cemetery is owned by St. Paul’s Anglican Church, it still honours the intention of the original donor, James Rosamond: any person is able to buy a plot (or columbarium niche) in the Cemetery. We welcome inquires of a genealogical nature, although we cannot promise to respond within any particular time frame. 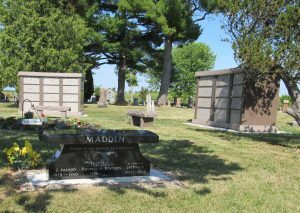 Some researchers have posted pictures of our Cemetery’s monuments on genealogical websites.